Freedom not borders! Unconditional European residence permit for all migrants! Saturday, the 13th of June, will be a day of mobilization of migrants in Italy and in Germany, with demonstrations in Bologna, Bari, Brescia and Frankfurt. Migrants, together with precarious and industry workers, will say laud and clear that they are not going to be the ones who pay the most violent backlashes of the crisis. While migration enters the public debate as a steady «emergency», only when the massacres in the Mediterranean keep happening, a true and daily war against migrants is fought on the internal and external borders of Europe. The division between economic migrants and refugees, as well as the new measures to face the arrivals from the Mediterranean, are just other tools to create hierarchies and to reinforce the widespread belief that migrants are something to be «managed» and «relocated», to be «used», while they become an unwelcome «burden» when they are not needed anymore. Migrants are supposed to pay double, with the risk of losing the residence permit, the general lowering of wages, the precarity of the working conditions, the high rents, the cuts in welfare, the inattention of the local administrations. Something that is not anymore difficult to understand for all those EU citizens that are moving from one European country to another and face the accusation of being «welfare tourists», the impossibility to get welfare benefits, the need of bringing evidence of one’s own usefulness. Europe is a space of transit and of ungovernable mobility, no matter how much the European government of mobility seeks to turn the movements of migrants to the sake of profit and political stability. On the 13th of June, we will say loud and clear that we want the end of the Dublin regulations that do not allow millions of people arriving in Europe to move freely across the borders. We ask to be a part in the management of the funds for migrants reception against the business that is flourishing on the skin of migrants. We demand equal access to social infrastructure like housing and health care so migrants can live their lives in a independent and self-determined way like everyone else. We mobilize for a European minimum residence permit of two years, independent from wage and income, against the European government of mobility, to overcome the distinction between refugees and migrants, to fight the hierarchies in society and workplaces created by differences in legal status that go at the detriment of all. The European minimum residence permit is a step forward to fight against the constitutive principle of the European policies on migration – that is the connection between residence permit and labor contract –, as a first step towards solidarity and freedom of movement! On April 17, 2013, nearly 200 Bangladeshi immigrants working in the strawberry production fields of the Peloponese town of Manolada, in Greece, demanded to be paid the six months outstanding wages that they were owed. In response, their supervisors opened fire on them, injuring 28 people. The controversies surrounding the Manolada case and it’s judicial proceedings seem to keep unfolding. The Bangladeshi migrant workers have not only been denied any sort of witness protection or financial compensation, they are now expected to pay legal fees related to the case. The court recently ruled their employer—strawberry trader Nikos Vaggelatos—as well as one of the accused gunmen, Kostas Chaloulos, not guilty. Two of the other supervisors were, however, charged. One for grievous bodily harm and the other for aiding by omission. During the trial, the legal team defending the workers asked for the president of the Mixed Jury Court of Patras, to be removed from her position. They said the judge’s attitude seemed biased towards the accused throughout the proceedings. Eventually, the judicial council rejected the request and, given that they considered it unfounded, ruled that the migrants should pay the costs incurred. 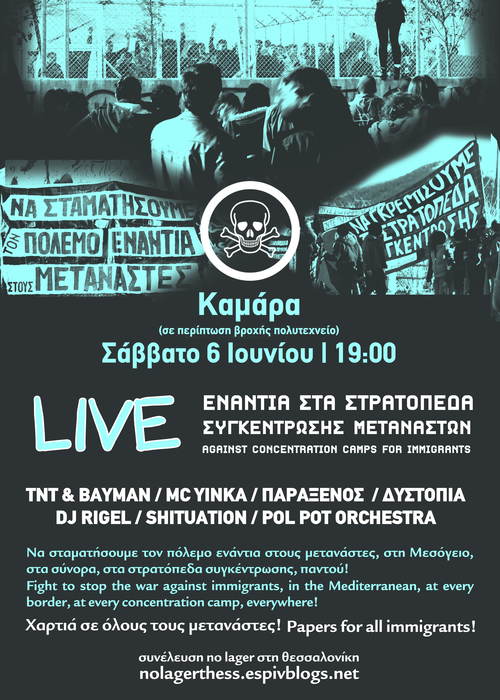 Concert: against detention centers, – stop war on migrants! In the Mediterranean, at every border, at every concentration camp, everywhere!